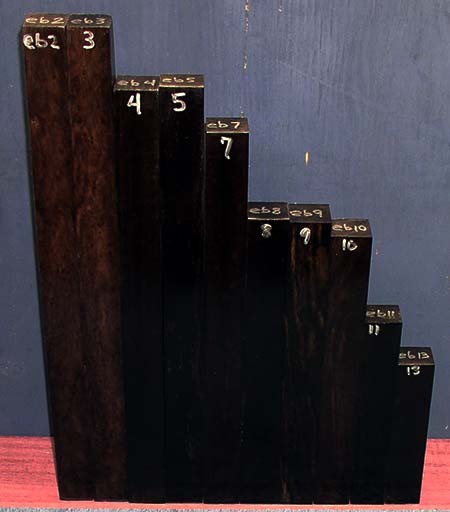 Ebony is a member of the diospyros family. 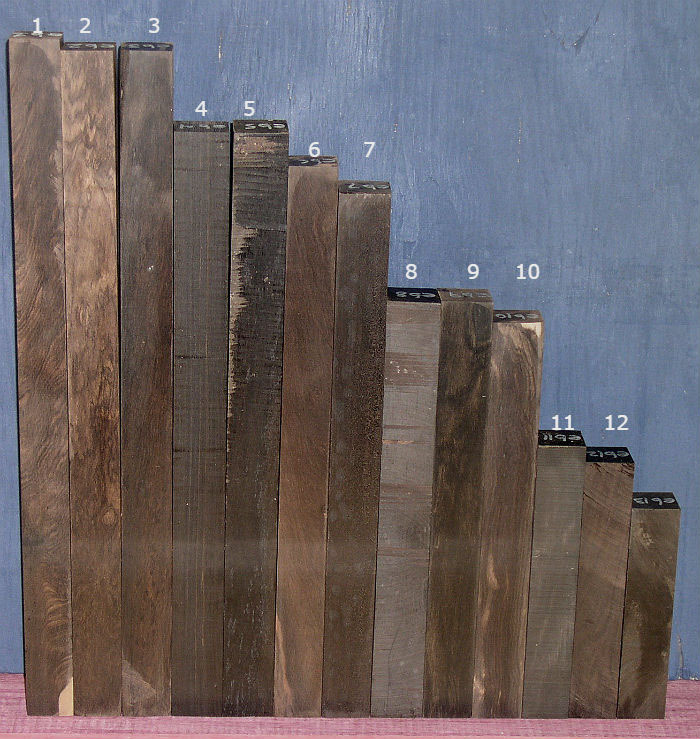 In the older trees, the wood is very black accounting for the reputation of this wood. Colors in actual pieces vary quite a bit with at least a little brown being seen in all but our upper grades. Truly black pieces are extremely rare now. 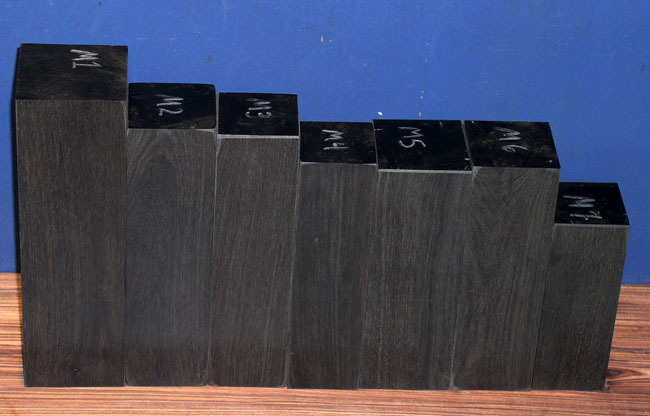 Ebony can vary somewhat in density. Variances from .80 to 1.16 are possible. 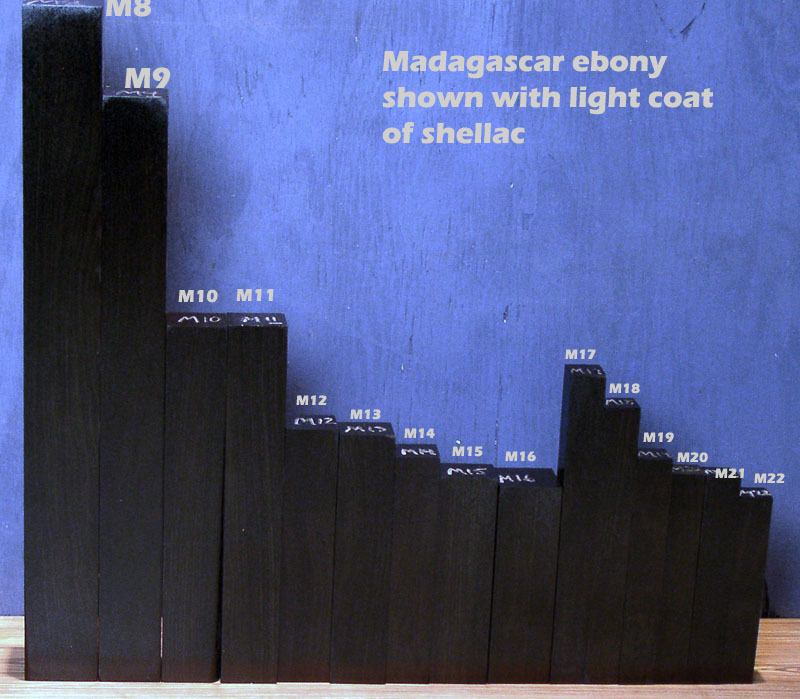 What today is called ebony is probably not the wood called by the Egyptians and in the Bible as ebony. 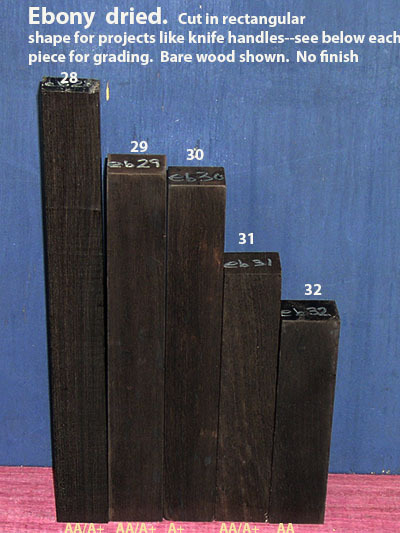 It seems that african blackwood was the wood they were referring to. 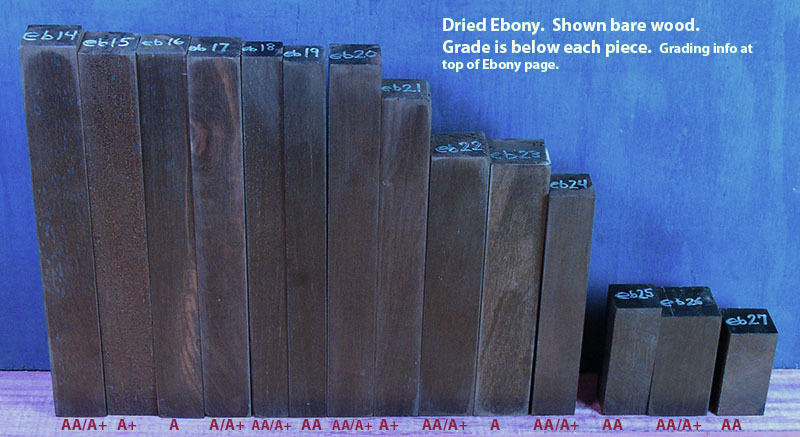 Ebony is darker however. 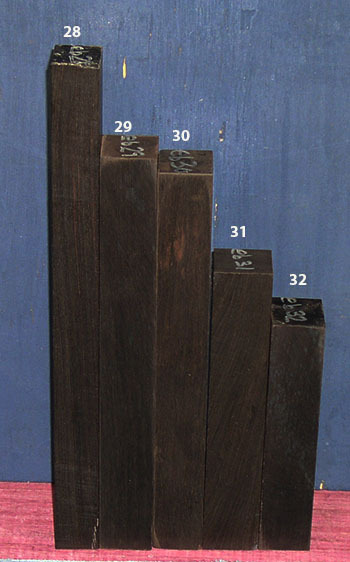 Grade B: Black/brown wood with noticeable lines that are contrasty dark tan/brown, and are usually not hidden without dyeing. 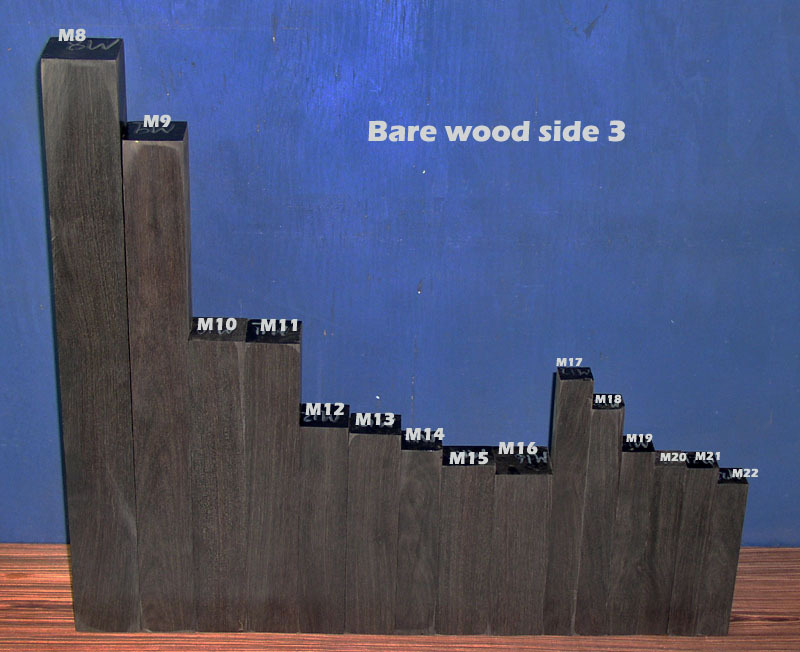 Dye is cheaper than dark wood! 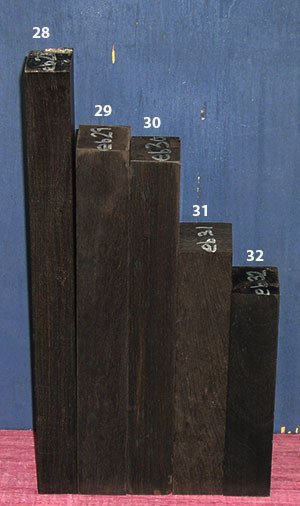 Grade A: Black wood with minor dark brown lines or areas, that SOMETIMES disappear through normal finishing or dyeing. 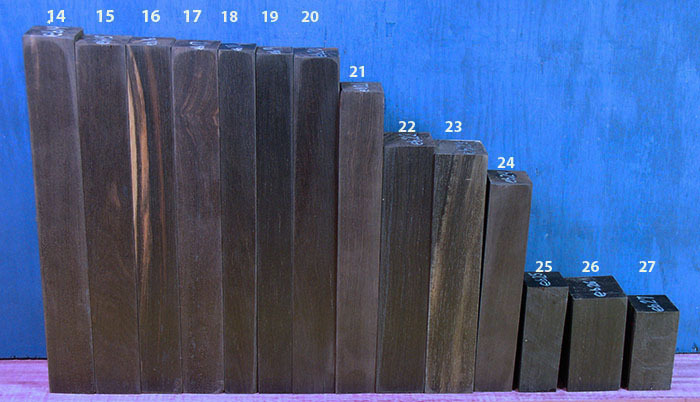 Grade A+: Black wood with very occasional tiny brown areas that are almost unnoticeable looking at the exterior of the wood. 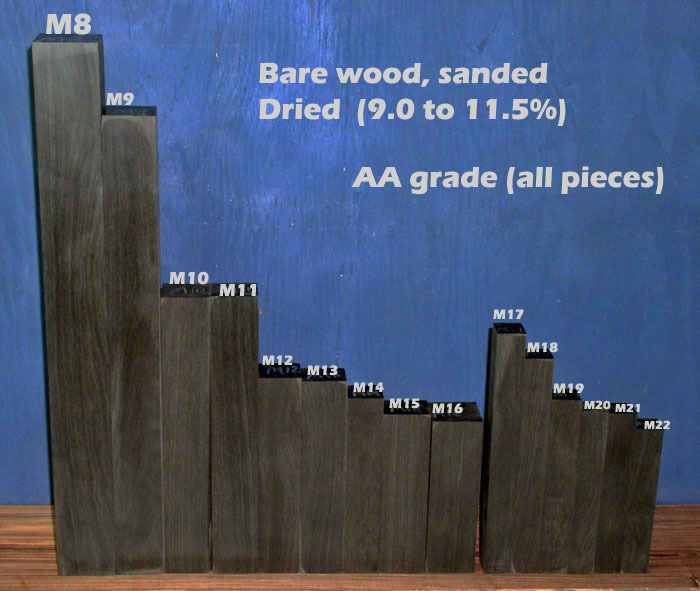 Grade AA: Very black wood that is almost all black on external surfaces (98%+) even before finishing. 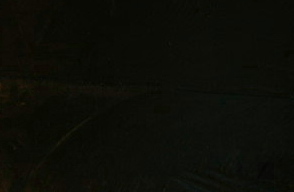 Very occasional tiny off color areas allowed if 98% black. 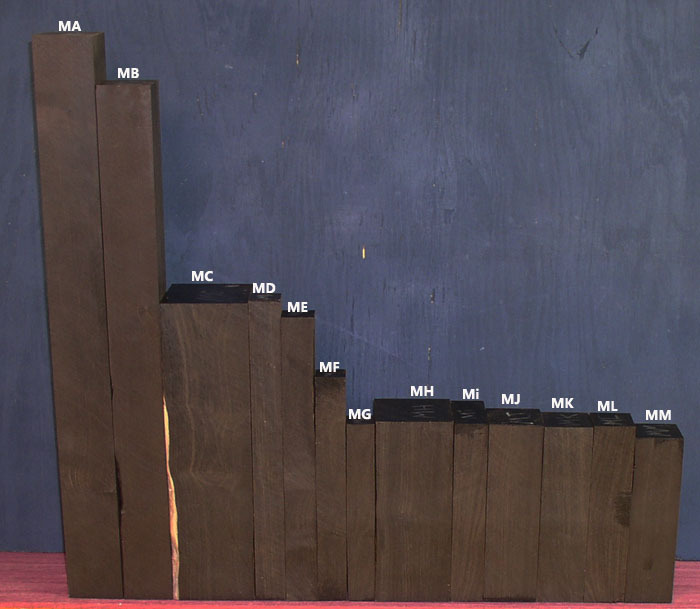 Grade AAA: Wood that is black as coal, very rare now--we haven't had a new piece like this in years and encourage you to be skeptical if someone says they have perfect black wood to sell. 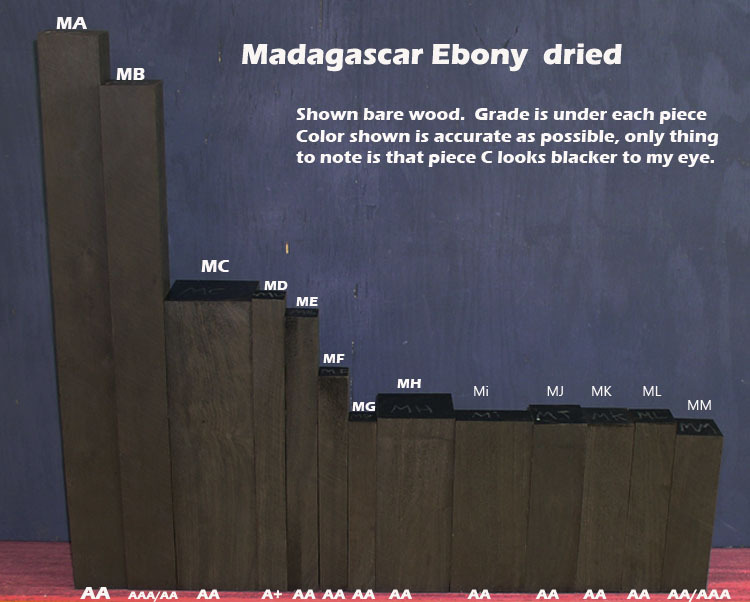 We have investigated claims like that and have so far always found them to be false unless it is a tiny piece of wood (with the exception of a very few pieces of Madagascar Ebony). 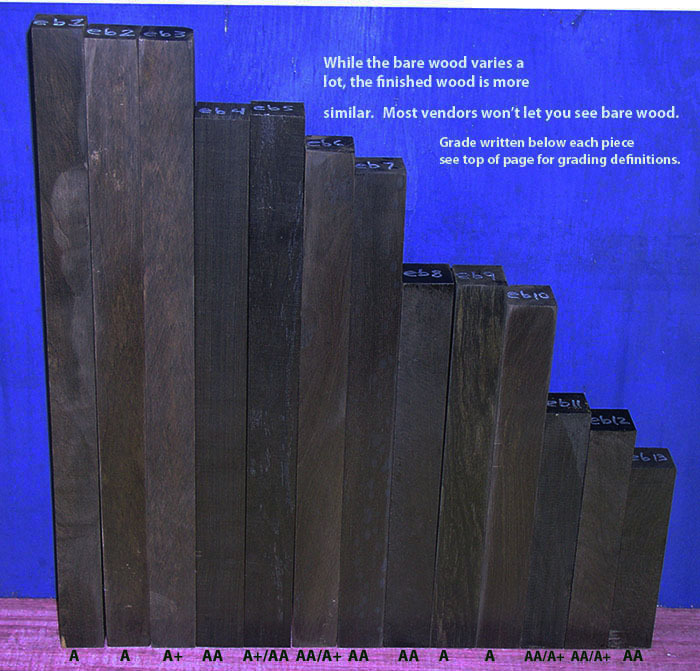 Some vendors take A or B grade wood and cover it in thick wax to make it appear they have AAA grade, we grade based on the bare wood color, which is completely different. 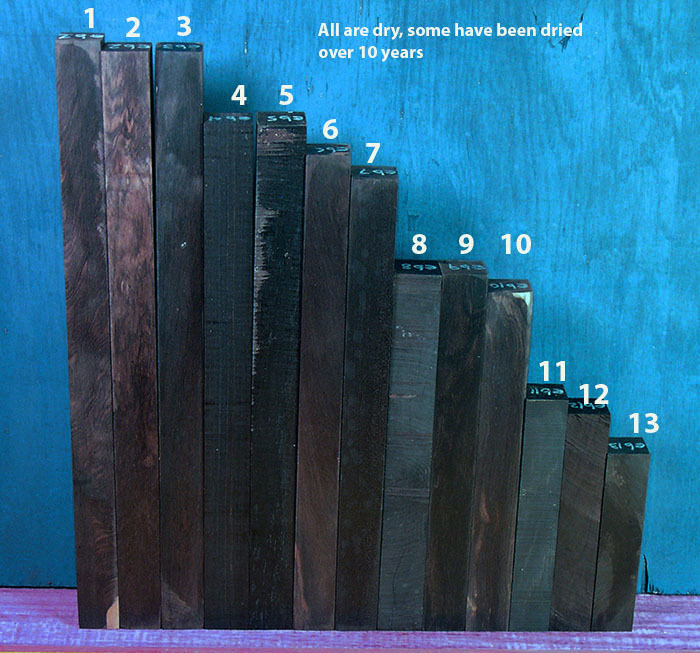 Kiln-dried: Each size that is kiln-dried is specifically marked. Those not marked kiln-dried== are not kiln-dried. This is old stock, comes from old trees that are generally not available anymore. and WILL give false readings. Our readings have been properly taken. 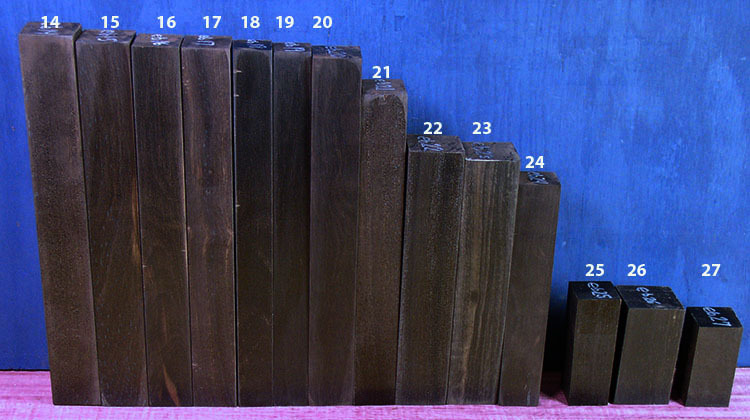 Air dried is the best way to dry ebony. The reason is that kiln drying can cause internal checks that cannot be seen until you have cut into the wood. That is a rare problem though, but we have seen it in some pieces that were kiln dried (maybe 2% of the time). Sides 2-4 also pictured, see below. These are shown bare wood with no wax or finish to hide the grain. We want you to see the actual piece you are buying, but finishing can make even A grade look close to all black. All pieces dry (for real) of course. Note that ebony is a little bit more brittle then some woods, and just because it is dry does not mean it won't crack if you get it super hot sanding it (if you cannot comfortably put your hand on it--then is too hot) or by hitting it with a hard object like a hammer, or dropping it on a cement floor. PLEASE READ THE GRADING SYSTEM AT THE TOP OF THE PAGE TO UNDERSTAND THE MEANING OF A, A+, AA ETC. If two grades are shown, it is in between those two grades. When two grades are shown, the one that is closest to correct is listed first. Pieces missing below have sold. Ebony in this section IS ALLOWED to be shipped internationally. Click here for a second side view. This photo shows this ebony with a thin coat of Renaissance wax, to give an idea of what the finished wood could look like. Clear coat finishes do darken the wood more then this, but due to extreme wet weather in my area, I could not put a shellac finish on as usual. Note that this wax can be rubbed off with a paper towel. See all four pics below of the bare wood sides of these pieces (this is what other vendors don't show--they only show the wood after finishing because that darkens it). 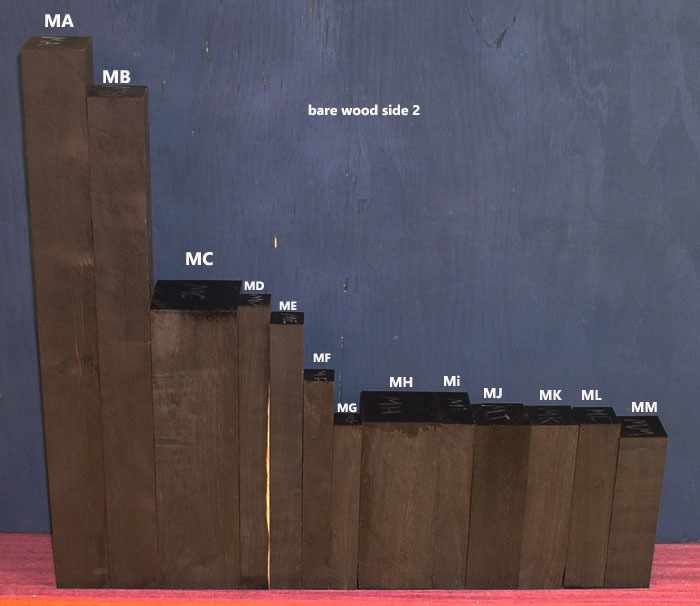 Note that the grading system is based on us looking at the wood when it is completely bare wood, not finished. These are shown bare wood with no wax or finish to hide the grain. 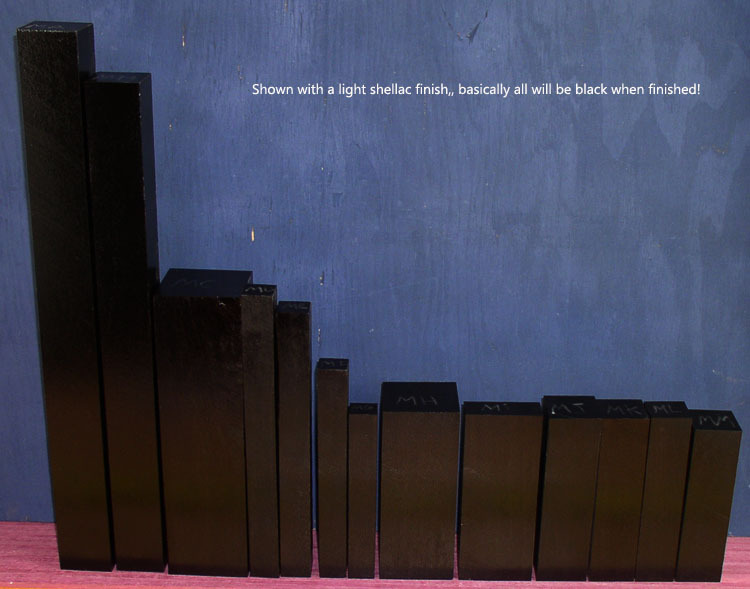 We want you to see the actual piece you are buying, but finishing can make even A grade look close to all black. All pieces dry (for real) of course. 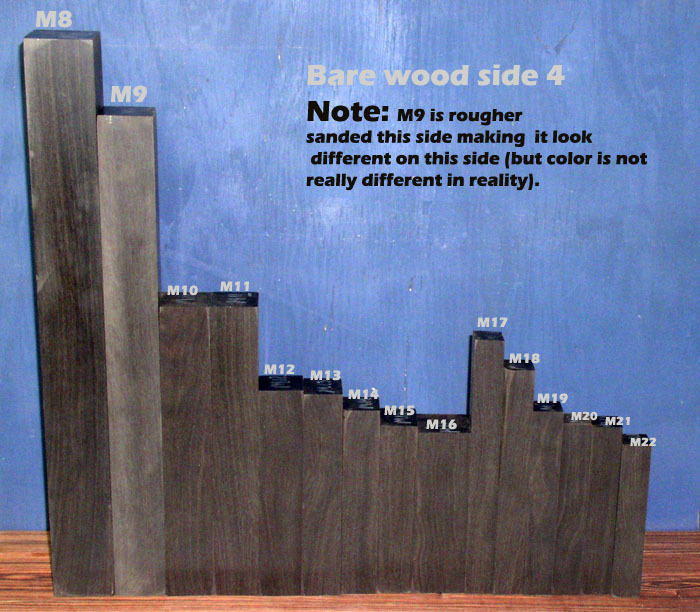 Note that ebony is a little bit more brittle then some woods, and just because it is dry does not mean it won't crack if you get it super hot sanding it (if you cannot comfortably put your hand on it--then is too hot) or by hitting it with a hard object like a hammer, or dropping it on a cement floor. Click here for a first side view. 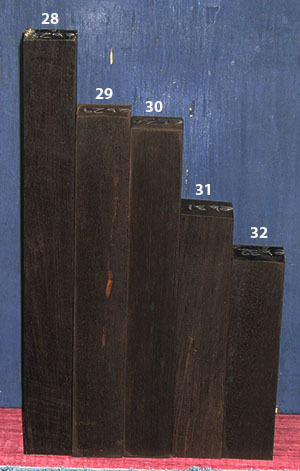 Pieces are shown above with a coat of shellac. 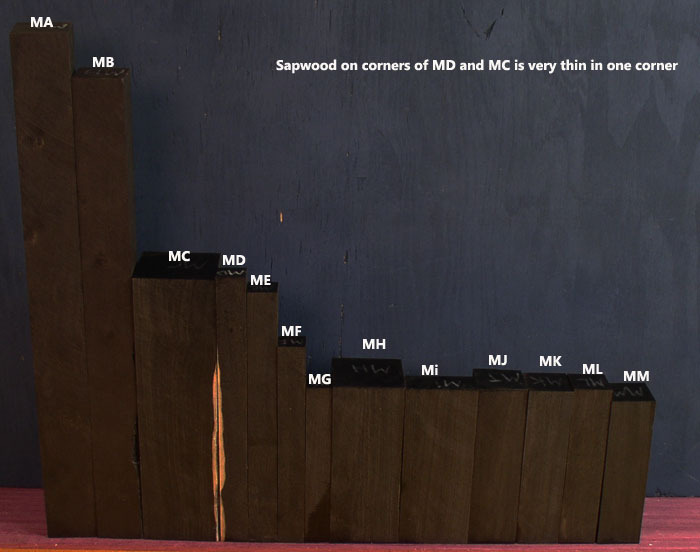 Bare wood (which other vendors won't show you), can be seen in pics of all 4 sides below. 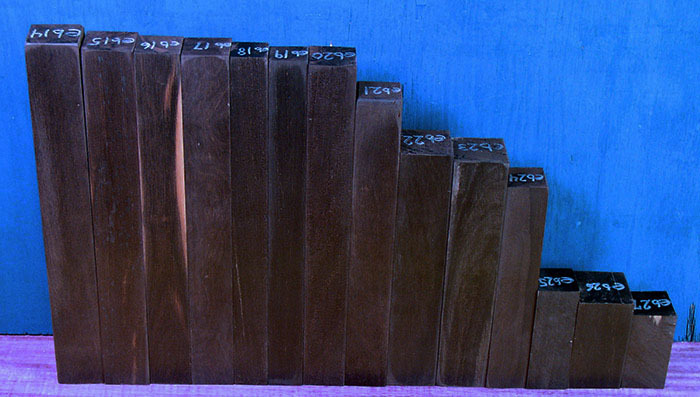 Madagascar Ebony, Diospyros perreiri, is considered to be the best type of ebony there is. The grain is incredibly fine, and sanding is a dream. When this is gone, it is gone. There is no way to get more, probably for the rest of our lives. Severe restrictions in place. Notes: Pieces are dried. Moisture between 8 and 11%. No defects visible on our close/careful inspection. Piece C is one of the largest pieces we have been able to cut. Pieces are shown bare wood, partially sanded. The grain is incredibly fine, and sanding is a dream. 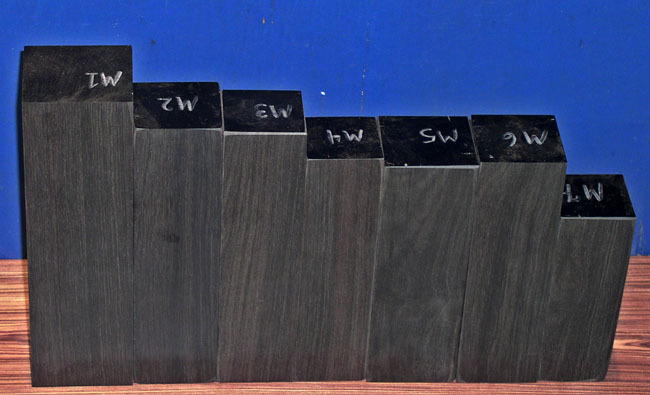 these blanks are selling for less then if we just sold the logs as they are. 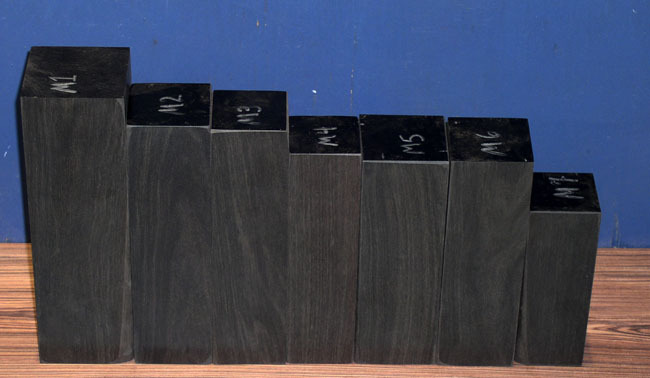 By far the best type of ebony you can buy, but it is rarely seen on the market at all anymore. 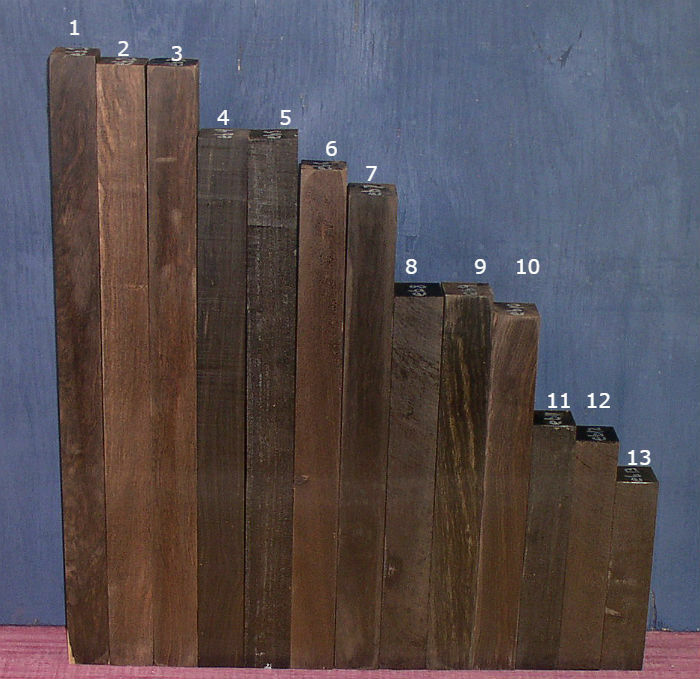 Pieces are shown above with a coat of shellac. Bare wood, partially sanded can be seen in all 4 pics below. 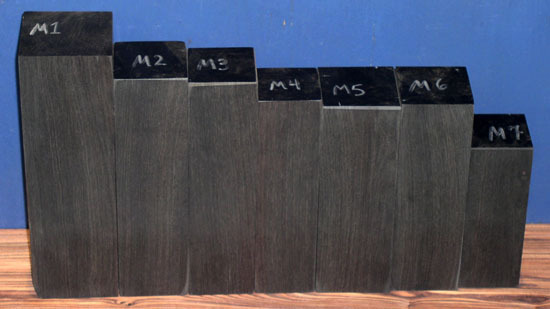 By far the best type of ebony you can buy, but it is rarely seen on the market at all anymore. 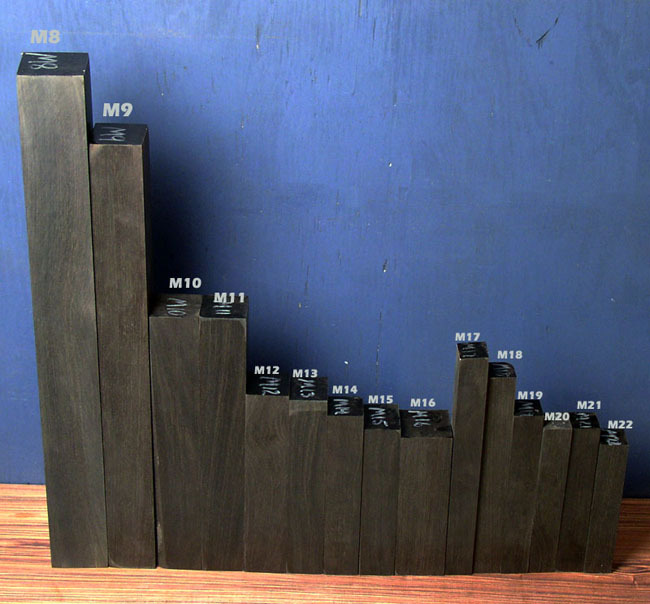 Notes: Pieces 13 and 15 are knife blanks. and desire to use some of our photos on your website, call us with your request.